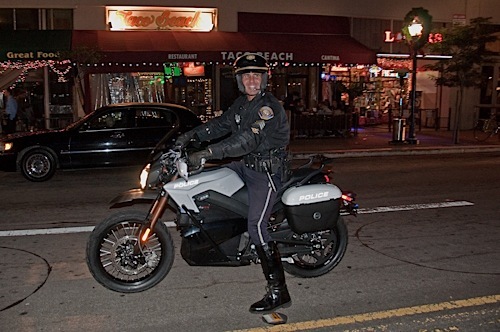 Have you ever wondered what would happen if a motorcycle police officer would ride his first electric motorcycle? I just saw and the result was he liked it. This is going to be a short story, the video explains it better than words could. How can you explain the exhilaration of an electric motor unless you drive one? The next best thing is a video. It’s one of those stories where you had to be there to appreciate it in its fuller extent. After the media hours of the Long Beach International Motorcycle Show, the Zero Motorcycles staff and invitee retired to the Agave bar and restaurant on Pine street. This is a cool place with plenty of great people, a fun time to be had by all. Terry Hershner’s Ride. You might not know yet Terry Hershner, but the story I will write about the interesting interview I had with this courageous fellow might change your mind about electric vehicles in general. Terry drove 3,000 miles from Miami to Los Angeles on the Zero Motorcycles Zero S ZF9s, the same one raced at the TTXGP that was ever so slightly modified. What were the modifications? Four extra on-board chargers in order to recharge as quickly as possible. The best part is that the motorcycle had the same race sticky Pirelli tires, all 3,000 miles of it. Long Beach Motorcycle Police. The evening party took an interesting turn when an intrigued Long Beach motorcycle police officer stopped to see the electric motorcycles. What he didn’t know was that in the van, the Zero Motorcycles team had a fully decked out Police Zero S bike. He was invited to check it out and we could see his interest growing. After a while, he was invited to test drive it on the streets. What follows below is his initial take and what he felt about the actual ride. What transpired was that mostly he felt he could ride one all day for a few reasons. The Officer asked all the basic questions, such as what was the range. His eyebrows raised when we told him about 130 miles, which is more than sufficient to cover the 80 miles or so he rides daily on his BMW. After having driven it he made a point not often made by many. He said he would rather ride this all day than a loud motorcycle. He admitted to being almost deaf at the end of a day riding his 2002 BMW. Although BMW makes some of the best bikes out there, he said riding a Zero Motorcycles S would be easier on the senses. Then he said this light bike would have another great benefit, that of sneaking up on suspect robberies. Enjoy this video. It’s a little harsh audio wise but his face says it all. Congratulations Zero Motorcycles on offering a great choice of motorcycles. What was truly revealing was to see a Long Beach motorcycle officer saying he could ride all day an electric Zero Motorcycle S.